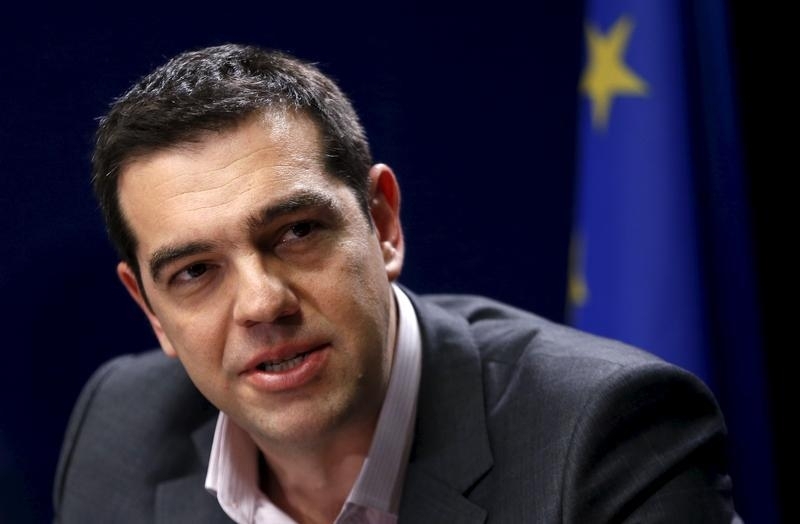 Alexis Tsipras has taken a massive gamble on Greece’s future. By calling a referendum on whether to accept the creditors’ latest offer of cash in return for unpopular reforms, the Greek prime minister is offering the people a choice between the bad and the extremely bad. Meanwhile, the world may be about to face the biggest default in history. The euro zone will probably survive, but its rickety structure will be sorely tested. Capital controls are likely before the Greek vote on the creditors’ terms is held on July 5. It’s not clear their offer will be on the table even if the people want it. If they don’t want it, a return to the drachma and more misery lie ahead. Tsipras is effectively calling for Greece to quit the euro. Both Greece and its creditors, the euro zone countries and the International Monetary Fund, deserve blame for the breakdown in talks. But Tsipras mishandled negotiations particularly badly by taking an excessively confrontational approach. One immediate consequence of the failure to reach a deal is that Greece won’t be able to repay the IMF the 1.5 billion euros it owes on June 30. Another is that Greece won’t be able to get an extension of the euro zone bailout, which runs out on the same day. The big unanswered question is whether the European Central Bank will continue authorising emergency liquidity to Greek banks during the week-long referendum campaign. It has been keeping the banks on life support as deposits have steadily drained from the system. But it will be hard for the central bank to continue this policy if the so-called bank jog turns into a run. Indeed, the ECB may decide to cut off liquidity pre-emptively over the weekend – something that would probably force Greece to impose capital controls or, at any rate, call a bank holiday during the campaign. Tsipras would undoubtedly criticise such a move as another attempt by foreign powers to humiliate his country. But the ECB might decide that Greece was heading for default whatever the referendum result and that, given the linkages between the state and the banks, it could not continue to view the banks as solvent or their collateral as adequate. This, indeed, is one of the problems with Tsipras’ move. Even if the people say they want the creditors’ proposals, it is not clear these will still be on the table in a week because the euro zone’s bailout programme will have expired. In theory, a totally new programme could be created. But, in practice, it will be impossible to persuade creditor countries such as Germany to approve such a deal if Tsipras is still in power. It is hard to see how Athens could avoid defaulting on some bonds owned by the ECB itself on July 20. Although Tsipras has vowed to respect the decision of the people, he will struggle to hang onto power if they vote against him. But that won’t make things a lot easier because no other combination of parties can form an alternative government. It is likely therefore that there would be new elections. It is possible that this could lead to a national unity government that then reached terms with the creditors. But the ensuing havoc would have damaged the economy further. What’s more, with the opposition in disarray, there’s no guarantee that even new elections would end the political paralysis. On the other hand, if the people backed Tsipras, it is hard to see any outcome other than Greece quitting the euro. Some might hope that the creditors would then back down. But it seems more likely they would harden their line. With the banks in meltdown, Tsipras might try to avoid the inevitable by issuing IOUs to pay his bills. But this is unlikely to do more than postpone the time before Greece returned to the drachma or whatever it would call its new currency. In theory, default and the launch of a new currency could give Greece a new lease of life after a sharp shock, provided Tsipras then pursued a responsible fiscal and monetary policy. But this doesn’t seem likely. Tsipras and his colleagues in the radical left Syriza party would be more likely to use their renewed control of monetary policy to print money. The new currency would then devalue massively, leading to rising inflation. There would also be such dislocation that unemployment and poverty would increase. Foreigners might also initially be deterred from visiting the country. That would be a blow to Greece’s most important industry, tourism. Meanwhile, the euro zone is facing the most testing time in its troubled history. The ECB’s so-called quantitative easing programme, which involves buying masses of bonds issued by euro zone governments, will probably keep things under control. But if Greece leaves the euro, there would be a nagging question over whether other countries in trouble might in the future quit too. In some circumstances, such doubts could become self-fulfilling. Beyond the economic repercussions, a so-called Grexit would unleash vitriolic recriminations. These could poison intra-European relations for years to come. Greece's Prime Minister Alexis Tsipras addresses a news conference during a European Union leaders summit in Brussels March 20, 2015. Hugo Dixon: What sort of man is Tsipras? Greece will hold a referendum on July 5 to decide whether the country should accept or reject a bailout agreement offered by creditors, Prime Minister Alexis Tsipras said in a late-night address to the nation. Tsipras moved to call a referendum hours after flying back from Brussels, where repeated rounds of negotiations with European and IMF creditors failed to produce an agreement. He said the creditors’ proposal heaped “unbearable burdens” on the nation and urged Greeks to give a “sound response” to the “ultimatum”. “These proposals, which clearly violate the European rules and the basic rights to work, equality and dignity show that the purpose of some of the partners and institutions was not a viable agreement for all parties, but possibly the humiliation of an entire people,” Tsipras said.Athens will ask for an extension of its bailout agreement, which ends on June 30, by a few days in light of the referendum, he said. The Greek parliamentill convene on June 27 to approve the cabinet’s decision to call a referendum, he said. “Greeks, with this blackmail to accept an austere and humiliating austerity programme which has no end and no prospect of getting back on our feet, I call upon you to decide patriotically and proudly as dictated by the proud history of Greeks,” Tsipras said.